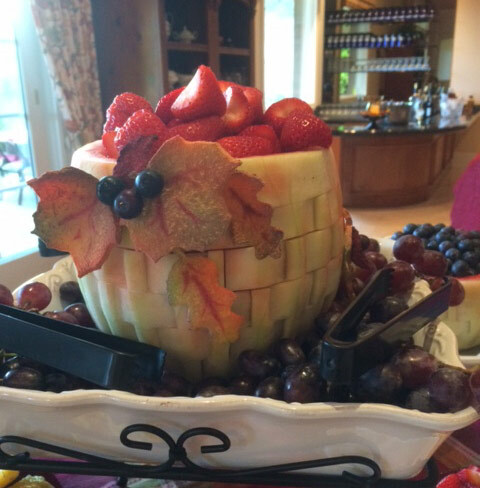 Take a look at the pretty Autumn fruit baskets that student / customer Mary Freeman created. I carved my 1st ever basket weave for a special event last night & wanted to share some photos with you. They were a huge success & I received so many wonderful comments on them. I made the leaves from finely sliced jicama & used food coloring to “paint” the leaves – this added to the whole fall presentation. 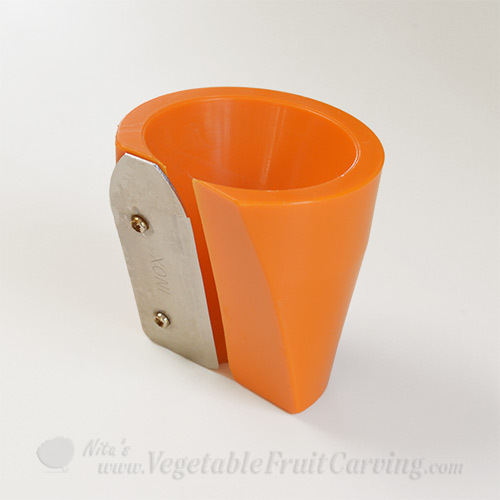 The melons also have a hint of spray food coloring to enhance the over all appearance. Thank you for such wonderful instructional videos! Here’s how Mary’s whole fruit table layout looked. Isn’t it pretty. She had 3 different woven look Autumn fruit baskets on her table. 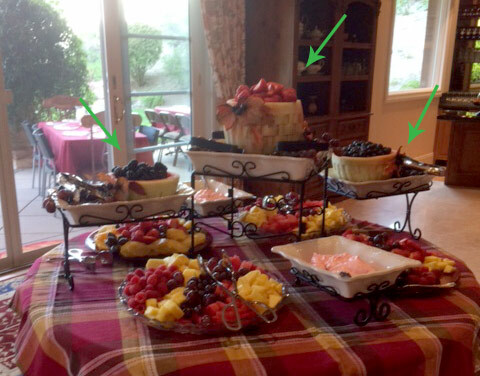 Notice how Mary arranged the fruit at many different levels to give it great eye appeal. 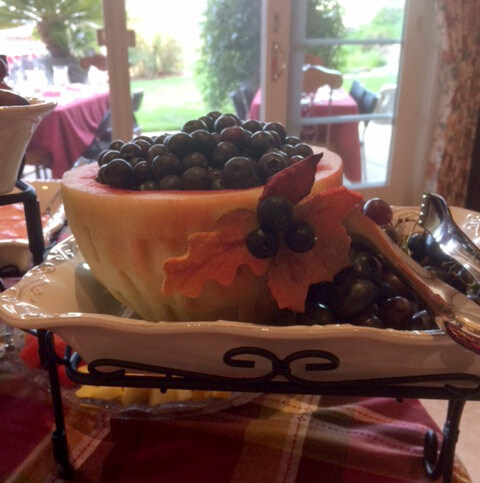 Here’s closer look at another of Mary’s carved fruit baskets filled with blueberries. As you can see, Mary “painted” her leaves with fall colors using food coloring and added a bit of spray food coloring to the bowls themselves to get this pretty Autumn look. 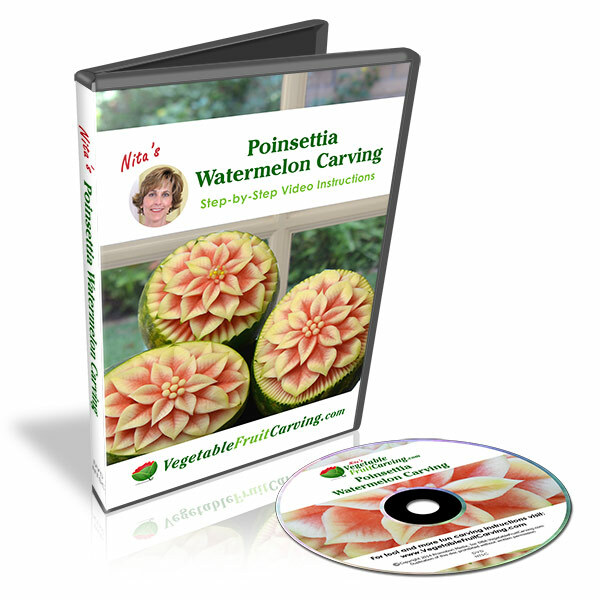 If you want to carve watermelons, honeydew and other melons with this pattern used for these Autumn fruit baskets, you will learn how, step-by-step, in our video lessons, Melon Basket Weave. You can learn at your own pace, at your own location, at your convenience. And, our Thai Pro knife is an excellent companion tool for this lesson. Check out the blog post below to see more fun ideas for woven look fruit baskets. You’ll see different variations created by other students of our Melon Basket Weave lessons. Glad you enjoyed seeing these, Luann.